Rich Ghilarducci has deep Humbold roots. Born in Fortuna, the CEO of the Humboldt Creamery has launched the local dairy co-op into the global market. His background in finance is an asset to the company -- and now to the county, as the company has become one of the largest grossing industries in Humboldt, one that has doubled in size in the last few years and managed to avoid a corporate takeover. We sat down with Ghilarducci to talk about transitions in the dairy business. Is organic milk becoming more important to the dairy industry here in Humboldt County? For six years we've been developing an organic program for our dairymen. By the end of 2006, 60 percent of our milk that we get from our member-owners, the dairymen, is going to be certified organic milk. So in six years it's gone from zero to 60 percent of our milk organic. It's becoming a bigger and bigger part of the Humboldt/Del Norte County dairy industry. By the end of 2006, 30 of the families and their ranches around the area will be certified organic, and so will their livestock. How does a farm become organic? It really depends. To certify the land organically there's two parts you have got to do. You have got to certify your land, then you have to certify your livestock, your animals. On the land, you can't use pesticides or commercial fertilizers on the land for three years. So if somebody has done that, it is a three-year process. In the worst-case scenario you'd have to stop fertilizing today and your land could become organic in three years. But if, say, somebody hasn't been using commercial fertilizers or pesticides on their land, they could get certified sooner. It really varies on each dairy, how quickly they can certify or not. That is on the land side of it. What it is for livestock is you have to feed them organic feed for a period of 12 months, and you cannot treat them with any antibiotics. So the livestock is a little different to get them transitioned. Is it an expensive transition? Yeah, it's real expensive. For that one year they have to buy organic feed to feed their animals, which costs more than conventional feed, [but] we can't sell their milk as organic, so they can't get paid as organic. We have a program to support the dairymen here within the co-op. We give them an incentive to help cover that cost with extra feed for that period of time, a subsidy to help them get over that transition. Yes. That hormone is naturally produced in cows; Monsanto introduced the artificial hormone that you could substitute in about 1990. Right when they did that, we took a position as a co-op to ban the use of that amongst all co-op members. We've never wavered from that position. You are seeing more and more people [who] have really taken the position that they don't want that in their dairy products. It is not really conducive for the dairy business in Humboldt Country. That is what we believe. Is there a replacement or alternative? First of all, it is naturally occurring in animals, and what you don't want to do is have the additional hormones. The only reason for it is to boost production. It speeds up the metabolism, which basically shortens their life. I don't want to say this, but they are almost like a machine, or a person on speed. That is what it does. It is not as common in our area. [None of] the organic dairies use any. Is organic milk processed here? The majority of it is. We actually supply some companies in the Bay Area with tankers of raw organic milk. You see those 6,000-gallon stainless-steel tankers that go south on the freeway. But probably 90 percent of it is processed here, in our facilities here. And then we take that finished product and it gets sold all over the United States. Under different labels or all under the Humboldt Creamery label? Some different labels, some Humboldt Creamery too. We do products for Organic Valley, a co-op out of Wisconsin. They have organic dairy products nationally throughout the United States, and we represent them on the West Coast. So, we're doing a lot of work on the West Coast for them. If you went to the plant here you'd see Organic Valley cartons going down the line. On the side of the Organic Valley carton there's a storyboard about the Humboldt Creamery. The two co-ops work together. You can see that their product out there is actually our milk from our dairies here. We're a little bit different from some cooperatives in the United States. A lot of the dairymen will band together and then they'll take all their milk and sell it to an independent private company and then that company is processing it. What we've done here is, we actually invested in processing equipment and all the assets, so we take the milk off the dairies and 95 percent of it goes to our plant here. Then it's processed into fluid milk in the cartons, ice cream or powdered milk. Those are the three products that we make here. Is powdered milk the main product you produce? It used to be. Now ice cream is. Powder is about 25 percent of our business, ice cream is about 70 percent, and then fluid milk is about 5 percent. That changed with the acquisitions that we did a couple of years ago. We bought three companies -- Darigold, Arctic Ice Cream and Vita-Rich Ice Cream -- two years ago and all of that [production work] has been brought into the processing here, which has boosted jobs in the area, and also those other labels have been converted to the Humboldt Creamery label. So, now all those products are Humboldt Creamery Ice Cream, throughout the western United States. 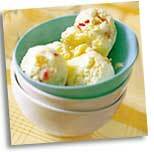 Is Costco's Premium Vanilla Ice Cream made by Humboldt Creamery? Yes, it's in every one of their stores [in] the United States, [plus] we ship it into Europe for them and into Mexico [and] Asia. It all comes out of the plant here at Fernbridge and not only that, we also supply them the milk and sugar ingredients mix for the ice cream bars [they sell] at the food court in the front. They're made at another company, but we supply all the ice cream mix: the milk and the sugar. We make that here because they believe the flavor of the milk from Humboldt County is something very special. They want all their ice cream in any of their product lines in the United States to come from milk out of Humboldt County. How has gaining acquisitions and getting bigger helped the Creamery remain a co-op? In the industry there's been a lot of consolidation [and] not just here -- other people we compete with across the United States, they're getting bigger and bigger and they gain efficiencies by doing that, by becoming bigger. We have been approached by other people outside of the area to say, "Well, why don't you guys sell out to us, or why don't you merge your business into ours?" But our dairymen here that own the co-op are fiercely independent. They said, "No, we want to be independent." So we went through a business process to make that decision, probably five years ago now. We looked at it, and once we decided we wanted to stay independent, we said, 'How are we going to do that? How are we going to become independent, or stay that way?' We had to get bigger, so what we had to do was start implementing a plan to go out and purchase other companies outside the area and bring that business into Humboldt County. Instead of being acquired by somebody else, we did the flip side of that, and said we want to be the acquirer and bring those jobs back to Humboldt County. It is a real plus for our region. It is a great thing for our region. Is dairy the No. 1 agricultural industry in the county? Actually, timber is [still No. 1 in Humboldt]. Dairy is the No. 1 industry in agriculture in California. A big part of the [state's] dairy industry is in the Central Valley region, from Modesto down to Bakersfield. What they do in the Central Valley is like cheese and butter and powder -- that is where their big markets are. The Humboldt/Del Norte region [only] produces one percent of California's milk, [but] we are one of the largest ice cream manufacturers in the western United States with things we produce out of here. We knew that if we were going to try and compete in the future with a small milk supply, we had to go into different product lines -- more "value added" product lines. If we would have just competed against block butter or just blocks of cheese we could never have been as efficient as those big plants in the Central Valley, which have a large milk share to draw from. Are you planning to continue expansion? What we did a couple years ago is just one step. We want to continue to grow the business and make it stronger -- on a national basis -- even though it will still be headquartered here in Humboldt County. Emily Wilson is a senior majoring in journalism at Humboldt State University. 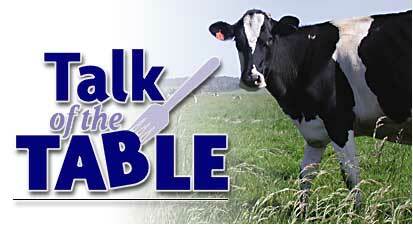 your Talk of the Table comments, recipes and ideas to Bob Doran.